Ralph Hyde was one of the world's formost authorities on moving panoramas as well as stationary panoramas, maps, peep shows and other art forms of the past. The picture to the right shows Ralph in 1984 in London. The obituary below was written by Erkki Huhtamo, a long time friend and colleague of Ralph's who expressed the loss well when he said "There is no one to take his place; personalities like Ralph simple do not appear any longer." Life is fragile. We have recently learned how painfully true this saying is: Ralph Hyde is gone. It is still hard to believe it, but Ralph passed away in London at his home on June 2, 2015. The worlds of panoramaniacs and early visual culture researchers and collectors have lost one of their most loved, outstanding and enthusiastic masters. Ralph left us suddenly, in full command of his enormous knowledge and very special skills and head full of projects to come. There is no one to take his place; personalities like Ralph simply do not appear any longer. What we have are the many precious memories, and of course his published works, which will shine a bright light to the distant future. Published in 1988, contains a chapter on moving panoramas and desciptions of over 50 moving panorama artifacts from the exhibit including illustrations, broadsides, toy moving panoramas, souvenirs and photos of moving panorama showman. As a modest man Ralph rarely spoke about himself or his achievements. Writing an obituary is therefore not an easy task. Hopefully I will be apologized for beginning with my own reminiscences of him. I first met Ralph in 1995, when I contacted him for a special reason. I wanted to interview him about panoramas for ”Archaeology of the Moving Image,” a television series I was preparing for the Finnish national television (YLE). I had been inspired by Panoramania!, the seminal book Ralph had created as an accompaniment to the eponymous, groundbreaking exhibition he curated for London’s Barbican Art Gallery (1988-1989). Sadly, I had missed Ralph’s exhibition, but I experienced Sehsucht (Bundeskunsthalle, Bonn, Germany, 1993), another formative panorama exhibition, for which Ralph acted as a consultant. I eagerly read the learned essay on moving panoramas he contributed to the catalogue. Our first meeting at the Guildhall Library, where Ralph worked as Keeper of Prints & Maps, was eye-opening. He warmly welcomed me to the world panoramaniacs, and a close relationship developed. It was Ralph who inspired me to study the history of the moving panorama, which finally led to my book Illusions in Motion (The MIT Press, 2013). During its long gestation time, Ralph sent me countless comments and pieces of information. He read the entire huge manuscript, broadening my perspectives and helping me to avoid many embarrassing mistakes. Our friendship and working relationship continued until the very end. During the final months of his life Ralph read my study on cosmoramas and, as usual, gave me expert advice. He promised to send me material from his huge archives for my book-in-progress on mechanical theaters. Although he hardly revealed it, I noticed how proud Ralph was about his latest achievement, the book Paper Peepshows. Having seen huge amounts of research material from the Jacqueline and Jonathan Gestetner collection piled up in his apartment, I remember silently wondering if the colossal task could ever be finished. But Ralph did it, and in a magnificent way. Ralph was not only one of the most trustworthy, hard working and intelligent people I have known. He had a wonderful British sense of humor, and an almost boyish enthusiasm for the many things he was working on. I did not notice any signs of what was coming. Neither did others. On the very same day when he passed away, Ralph had visited the Gestetners to prepare for a presentation at the Courtauld Institute’s conference on ”Scrolls.” A few days earlier I had sent him an email, asking if he could meet me for dinner the coming Sunday, as I was going to travel to England to continue my research in Sheffield. I did not get a reply. In his final message Ralph wrote about his intention to update his testament. He was thinking about leaving his archive to the Victoria and Albert Museum and the unfinished dictionary of British panorama painters and showmen to the Bill Douglas Centre at the University of Exeter. Ralph was born in Uxbridge, Middlesex in West London on March 25, 1939, on the eve of the second world war. His father was Douglas Hyde, who became a well-known journalist and political campaigner. His mother Gladys (born Jones) came from Colwyn Bay in North Wales, and spoke Welsh as her first language. Due to the London bombings, Gladys and his two young sons, Ralph and Jeffrey, were evacuated to Wrington in Somerset, where they stayed with Douglas’ parents, who ran Hyde’s Hygienic Bakery there. During the war Douglas left Gladys for another woman, leaving her to take care of the two sons under the roof of relations who had been looking forward to a quiet retirement. According to his daughter Jeannette, her father lived in such circumstances, first in Wrington and later in Burnham-on-Sea, until he was 15 years old. It was rough to be a single mother in those days, so Gladys, who helped at the bakery, let people presume that her husband had been lost in the war. When his elder brother Jeffrey moved to Bristol to study medicine, Ralph followed him and finished his college there. Ralph did his military service in the RAF in Kidbrooke in South East London, after which he went to study librarianship in London. London As It Might Have Been, published in 1982. Ralph Hyde’s FLA thesis, ”Printed Maps of London: 1851-1900,” was approved for the Fellowship of Library Association with a mark of distinction in 1971 and published as Printed Maps of Victorian London, 1851-1900 a few years later (Folkestone: Dawsons, 1975). In 1965 Hyde had begun working at the Guildhall Library, the eminent institution that specializes in the history of London. He started as Assistant Librarian, became Assistant Keeper (1970-1975) and was finally elected Keeper of Prints & Maps, a position he held until his retirement in 1999. Ralph was the formost authority on his field. He lectured and wrote on London images, early town plans and prospects, publishing, among others, Printed Maps of Victorian London, 1851-1900, London As It Might Have Been (with Felix Barker; London: John Murray 1982, reprinted 1995), Getting London in Perspective (London: Barbican Art Gallery, 1983), and The Streets of London, 1880-1928: Evocative Watercolours by H.E. Tidmarsh (Colchester: Red Scorpion in association with Guildhall Library, 1993). Rhinebeck Panorama of London, 1981. 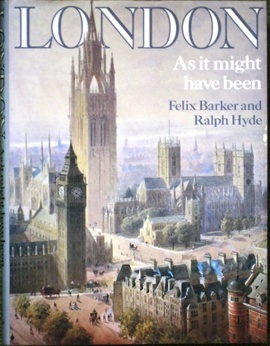 Ralph prepared many publications for the London Topographical Society, including its all-time bestseller, The Rhinebeck Panorama of London (1981). It was based on an outstanding bird’s-eye view of London from the earlier nineteenth century, which Hyde had rediscovered and identified. It is now treasured at the Museum of London. Ralph’s other books for them include The A to Z of Victorian London (1987), Ward Maps of the City of London (1999), London Displayed: Headpieces from the Stationers’ Almanacks (2010) and The A to Z to Charles II’s London 1682 (with Peter Barber, 2013). Ralph also acted as an advisor and consultant to the Motco Image Database (www.motco.com), supplying commentaries for historical London maps and panoramic views, such as Richard Horwood’s map of London 1799 (2006), Christopher and John Greenwood’s map of London c. 1830 (2005), and Grand Panorama of London from the Thames 1845 and 1849 (2000). Ralph’s interest in panoramas as a medium was a natural outgrowth of his work with maps and prospects. 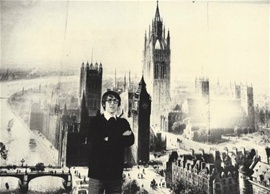 As Scott Wilcox, the Deputy Director for Collections at the Yale Center for British Art and one of the many people Ralph inspired, reminiscences, ”by the time I met him, which would have been in 1975, he already had a reputation as THE person who knew about panoramas.” At the time there was little public information available about them. Stephan Oettermann’s seminal Das Panorama was published in German in 1981. It was huge, but left many things to be said and discovered. Ralph published a work on The Regent's Park Colosseum (London: Arthur Ackermann, 1982), the huge panorama rotunda, a kind of virtual reality of the time, that entertained Londoners for decades from the late 1820s onward. He then curated two exhibitions on panorama-related subjects, Gilded Scenes and Shining Prospects (Yale Center for British Art, 1985) and Panoramania! (Barbican Art Gallery, 1988-1989). In his meticulous way, both were accompanied by substantial books/catalogues. Panoramania! The Art and Entertainment of the 'All-Embracing' View (London: Trefoil Publications & Barbican Art Gallery, 1988) is still considered one of the most authoritative books on the topic. 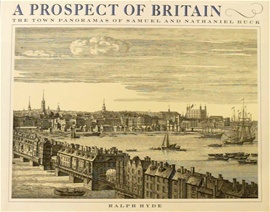 A Prospect of Britian: The Town Panoramas of Samuel and Nathaniel Buck, 1994. Ralph’s others publications on panoramas and related subjects are too numerous to be listed here in full. 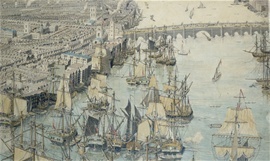 They include London from the Roof of the Albion Mills: A Facsimile of Robert and Henry Aston Barker’s Panorama of 1792-3 (Guildhall Library in association with the London Topographical Society, 1988), A Prospect of Britain: The Town Panoramas of Samuel and Nathaniel Buck (London: Pavilion, 1994), and many articles published in the Print Quarterly, in collected volumes on panoramas, and elsewhere. Several texts were first read as papers at the International Panorama Conferences. 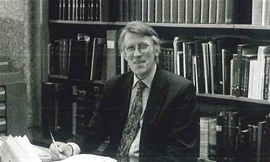 Ralph was a member of several scholarly associations, including The Magic Lantern Society, The London Topographical Society and The International Panorama & Diorama Society, whose newsletter he edited between 1989 and 1991. The latter was founded in 1984 by Brian Polden to bring together panorama enthusiasts from all over the world. Its interests included not only panoramas and dioramas but also related subjects such as peepshows, optical toys, photography, magic lanterns, and restoration techniques. It was a forerunner of the International Panorama Council which had its start in 1992, just one year after the society had run out of business. Unlike the IPC, the society did not organise annual conferences. It was mainly through its newsletter that news and information were being communicated to the members. When Ralph retired from the Guildhall Library in 1999 - he spoke about a ’semi-retirement’ - he began working with Jacqueline and Jonathan Gestetner, cataloguing their vast collection of panoramas and optical toys. As Jonathan recalls, he first met Ralph in the beginning of the 1980s when he was preparing London As It Might Have Been with Felix Barker. 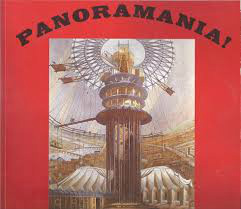 Outstanding items from their collection were included in Panoramania! as well as in Sehsucht. In later years the Gestetner treasure trove provided Ralph many exciting scholarly challenges. One of the results was the pioneering article ”Myrioramas, Endless Landscapes: The Story of a Craze,” Print Quarterly, Vol. XXI, No. 4, (December 2004). Myrioramas were another nineteenth-century craze. They were sets of cards with pieces of landscapes. The cards could be arranged in any order, producing an almost endless variety of different panoramic views. Paper Peepshows: The Jacqueline and Jonathan Gestetner Collection, 2015. But there was more to come. When Jonathan suggested for Ralph the idea of producing a book about their huge collection of folding paper peepshows, a little known topic, he was at first not very keen, but soon became passionately interested. ”It was a subject which he 'attacked' with his customary intellectual rigour,” Jonathan remembers. 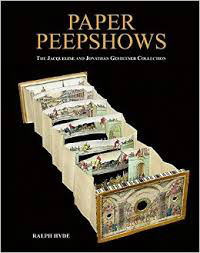 After years of work, the massive and beautiful volume Paper Peepshows: The Jacqueline and Jonathan Gestetner Collection (Woodbridge: Antique Collectors’ Club, 2015) was finally published in early 2015. Ralph lectured about it also to the members of the Magic Lantern Society. With Panoramania!, Ralph considered Peepshows as his main achievement, a conviction the universal praise it has already received has confimed. If his life had to end, at least it happened at a moment when Ralph could feel a sense of achievement. He could have produced new books but had already achieved more than most of us ever will. There are many who will be missing him, but Ralph’s final masterwork will be an inspiration for researchers and collectors of the future and a glorious part of his legacy. Ralph was preceeded in death by his wife Ruth, who passed away nearly a decade ago. He is survived by three children, Jeannette, Nicholas and Alice, and seven grandchildren. This video is from the International Panorama Council Conference of 2007. Ralph describes scenes in a newly discovered toy moving panorama from the early 1900s. From the Jacqueline and Jonathan Gestetner Collection. Sue Truman - This page was created in 2015.